I’m alive! 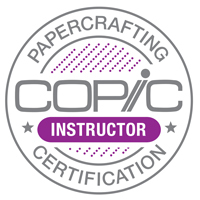 And, yesterday afternoon, I got to stamp! I had sometime to myself yesterday afternoon, and I was excited to participate in the Featured Stamper Challenge at Splitcoast. 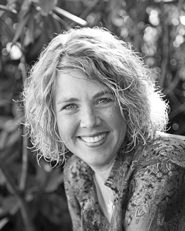 Bonnie is such a fabulous card maker, so it was fun to peek through her beautiful gallery. 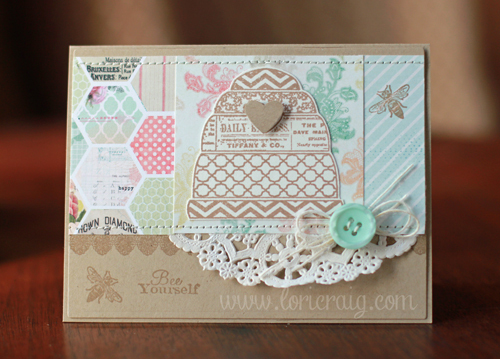 I love her style, and this card gave me a great excuse to ink up some new stamps that I just had to order after seeing them at CHA: Meant to Bee and Where My Honey Is from Darcie’s. 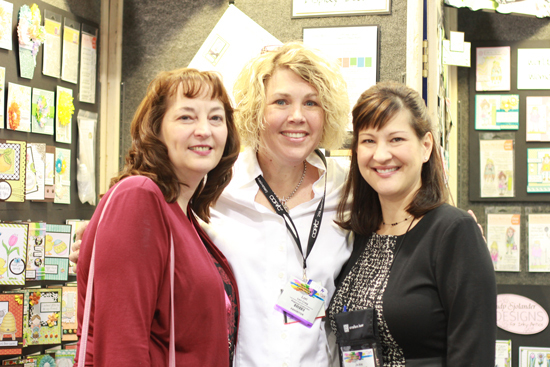 Jami (left) and I always try to spend some time walking the CHA show floor together, and stopping in to visit with Jackie (right) at Inky Antics is always a highlight. Jackie is just a doll, and her stamps are darling. She’s always in the Stamper’s Anonymous booth since her line and Darcie’s from today’s project are both manufactured by Stamper’s Anonymous. You’ll be seeing some *inky* goodness from her here on my blog soon. So many cute things. We always enjoy catching up about the industry, trends and life. Hands down, people are my favorite thing about paper crafting. 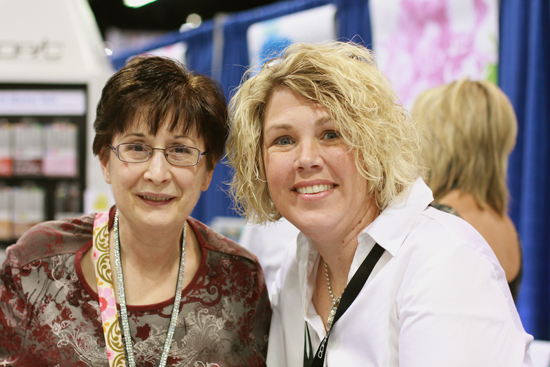 I love ink, stamps and embellishments, but some of my dearest friends are people that I share a paper chain connection with, and this is Phyllis. Phyllis and I *met* on the Stampin’ Up! Demonstrator site, SUDSOL over 10 years ago. We participated in swaps together and shared business ideas. For years she has been sending me CowTails, just because. I didn’t know what she looked like, we’d never met in person. So when we were chatting in the Copic booth and recognized each other at the same time, I was elated. She’s just as sweet and dear in person. 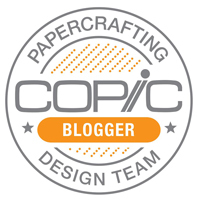 Paper crafters are just *good* people. One of my good friends and her husband coach the rodeo team at our local college. We graduated 15 seniors from the team this past weekend. This is a very quick & easy card that I made for each of the two girls that I’m closer to. They are sweet girls (great athletes), and it’s been so fun to get to know them and live that college life once again, vicariously, of course. Some things just don’t change. LOL. I had been itching to use this Waltzingmouse set, Back in the Saddle. The stamps just showed up in my mailbox one day with a super sweet note. The sender knows me well, and I was grateful for the thoughtful gift. 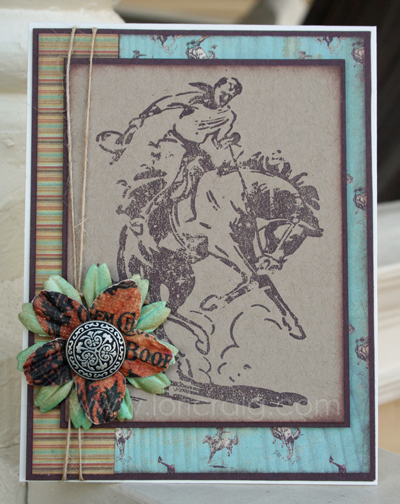 🙂 The horse image is from a Stamper’s Anonymous set by Tim Holtz, Wild West. 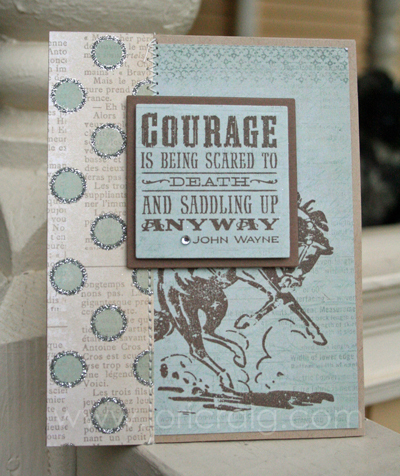 Since my card was for sweet girls, I chose to place the sentiment right over the top of the cowboy on the bucking horse. The paper is My Mind’s Eye, Lost and Found collection. A hard refresh (COMMAND-R for Mac lovers or CTRL-F5 on PC) will ensure you are seeing the latest post on this blog. 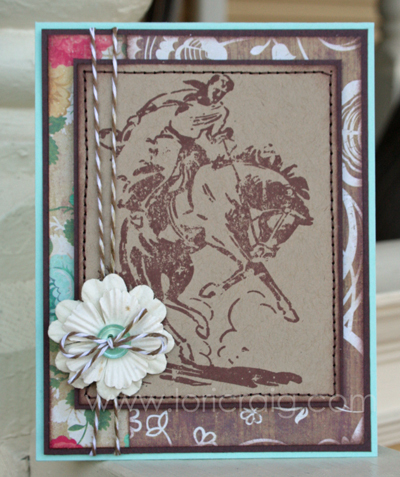 When I saw this new Tim Holtz set, Wild West, from Stampers Anonymous it could not get it into my shopping cart fast enough. I’m quite sure I didn’t take a full breath between ‘add to cart’ and ‘confirm purchase’. I guess you could say I have a thing for cowboys. Always have. Always will. Both of these cards work for yesterday’s Color Challenge at Splitcoaststampers. Not much to say about the design. I changed the papers up on each one (top card uses Portrait Collection from Crate and the bottom sample uses Wanted from Cosmo Cricket), and I’m pretty happy with how quickly these came together. 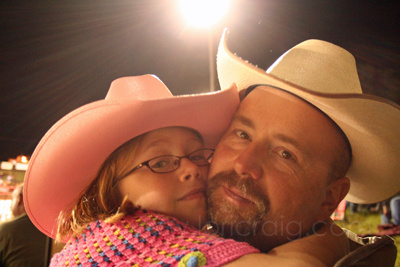 Here’s a quick picture of my favorite cowboy. This man is a constant reminder of God’s prevenient grace at work in my life. The Lord gave me what I needed when I didn’t even know what to ask for. I am blessed beyond measure. Have a wonderful Wednesday, my friends.